Access the weekly Lightning Letter for volunteer opportunities! A – ALWAYS sign in at the main school office when you visit Normal Park AND fill out a volunteer slip (found outside the office). These are our only records of your hours, and we must have them on file for all families. The only exceptions are school-wide SPARK meetings or work days—if you sign in at those events, we will record hours from the sign-in sheets. And, please turn in all hours—even if you volunteer more than 18 hours per year. B – BE sure to get your 18 hours completed by April 26 at 5pm. If a family has children in more than one magnet school, the hours must be split equally among each school. For example, if you have children in 2 magnet schools you must complete 9 volunteer hours in each school. We ask that families complete ½ of their hours by December 19th. Don’t wait until the last minute—there might not be enough volunteer projects to go around! All volunteers MUST be 18 years or older to qualify for school volunteer hours. C – CHECK out the weekly Lightning Letter and www.normalpark.com for volunteer opportunities. Feel free to contact Heather Cockerham, Parent Volunteer Coordinator, at (423)498-6880 or cockerham_h@hcde.org. Chaperone a learning expedition. 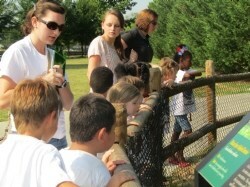 At Normal Park, our parents are active participants in our student learning expeditions to our museum partners. Choose at least one learning expedition every 9 weeks to attend with your child. They are always on Tuesdays or Thursdays, and a list of all expeditions is sent home at the beginning of each 9 weeks. Please note the maximum volunteer hours provided for day trips is 5 hours and 8 hours for overnight learning expeditions. All chaperones must have a valid background check to assist with learning expeditions and be responsible for a group of students. Visit a museum partner with your student. You can earn up to 5 volunteer hours simply by using your child’s Museum Passport to visit the Tennessee Aquarium, Creative Discovery Museum, Hunter Museum of American Art, Chattanooga Zoo, Chattanooga Nature Center or Bessie Smith Cultural Center. Parents earn one volunteer hour per visit. To earn credit, you must fill out a Museum Visit form with your child during your trip to the museum, so pick up one in advance from the Volunteer Center or download a copy at the bottom of this page. Volunteer on a Saturday workday or school-sponsored event. Special events such as the NormalPalooza arts festival and the Fork and Gavel Auction are great ways to knock out multiple hours in one day! Homemade goodies and all food and beverage donations are limited to 6 hours per school year. We need baked goods for the Happy Cart that we treat teachers to each Friday. 1 hour = 24 baked goods, concessions, items requested, or drinks donated. 2 hours = 48 baked goods, concessions, items requested, or drinks donated. No Monetary Value is placed on volunteer hours. Hours for larger donations (auction items, equipment, or supplies) will be considered on a case by case bases and determined by the Administration. Volunteer hours are not given for items donated to class or holiday parties. Volunteer hours are given to those who plan, prep, serve, or clean up the classroom parties or holiday events. Lightning Athletic Club: We need help manning the gates at events, concession stands, Spirit stores, at both Upper and Lower School sports events. Coaches can always use help coaching and maintaining the sports fields. Emails are sent during the sports seasons to request help for events and items needed for donations. All volunteer coaches MUST have a background check and pass a concussion course to serve as volunteer coaches. Please note the maximum hours for volunteer coaching is 20 hours. Team Meals: Please use the Donation Rules listed above. Join a SPARK. There are several NPMM committees that need help throughout the year, such as Library, Promotions, Fundraising, Advocacy, Hospitality, and Building and Grounds. Help out in the classroom. Talk to your teacher or room parent about how you might help inside the classroom. Please arrange a convenient time to talk to your teacher—do not drop in while class is in session. Attend SPARK meetings and parent workshops. Adults earn one hour for attending SPARK meetings, parent workshops, principal’s coffees and other special parent events. Note: Parents do not earn hours for attending parent conferences with the teacher, sporting events, or student performances unless they are volunteering during these events. Take home projects (Box Tops, Sharpening Pencils, teacher projects, etc.) are always available at NPMM. Watch for emails from your Parent Volunteer Coordinators. Projects are given on a first come first serve bases and hours vary with every project. Please be mindful of due dates for projects. Consider being a Room Parent. Creating open communication with parents and teachers is a great way to get to know your teacher, your student peers, and other NPMM families. Please note that all items donated to class or holiday parties are not considered a donation for hours. Volunteer hours are given to those who plan, prep, serve, or clean up the classroom parties. Drop by the Parent/Teacher Volunteer Work station located in the back of the office by Mrs. Cockerhams’ desk at the lower school or outside the volunteer work station at the Upper School near Mrs. August's room. Teachers will be leaving projects to complete. NOTE: It is extremely important to respect teacher deadlines for these projects. Contact Heather Cockerham at the Lower School cockerham_h@hcde.org or Sonia August at the US august_sonia@hcde.org for assistance or to learn more about volunteer opportunities and get you involved.